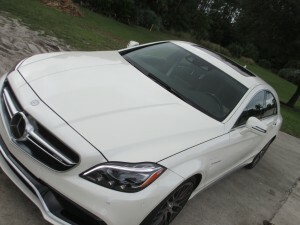 The Mercedes-Benz CLS63 AMG four-door coupe line gets a performance upgrade and introduces an entirely new model to its 2014 lineup with the CLS63 AMG S-Model. 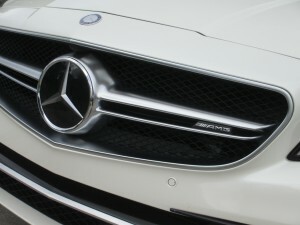 The S-Model boasts performance-oriented AMG 4MATIC all-wheel drive and an AMG 5.5-liter V8 biturbo engine that now makes 577 horsepower and 590 lb.-ft. of torque. 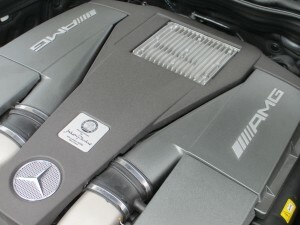 The AMG 5.5-liter V8 biturbo engine (known internally as the M157) continues to be a pinnacle of efficiency: an unusual combination of high performance and high fuel mileage that remains unrivaled worldwide in its market segment. Mercedes-Benz AMG is also launching a number of high-performance sedans and coupes with an AMG-engineered version of the all-wheel-drive system known as 4MATIC. Geared to sporty driving, this system offers drivers a level of performance never before seen in the segment. Alongside the successful SUVs – ML63 AMG, GL63 AMG and G63 AMG – five unique models in the CLA, E-Class and CLS-Class lines are now available with a standard high-performance AMG 4MATIC system. 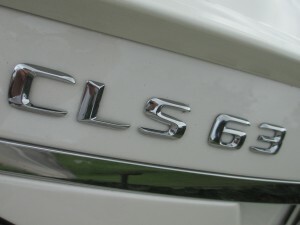 With 0-60 mph acceleration in 3.6 seconds, the CLS63 AMG S-Model 4MATIC is clearly at the top of its competitive line-up. In addition to its increased power, the special edge of the S-Model can also be attributed in no small part to performance-oriented all-wheel drive with a 33 : 67 front-rear power distribution. 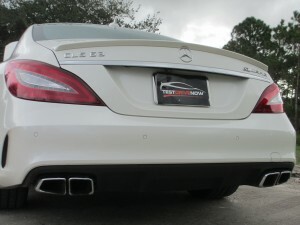 Ideal traction during acceleration minimizes wheel slip, and its electronically limited top speed stands at 186 mph. 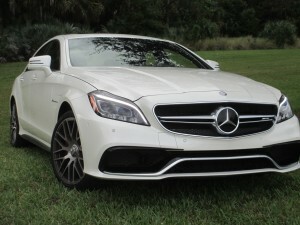 On the new CLS63 AMG S-Model, the AMG 5.5-liter V8 biturbo engine produces 577 horsepower and 590 lb.-ft. of torque, an increase of 27 hp over the AMG Performance Package that was previously available as an option for the coupe. 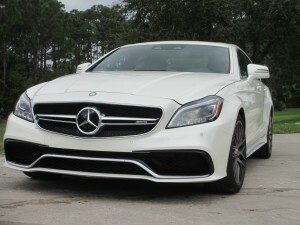 This enhanced performance results from adapted engine electronics and increased turbo boost pressure, from 0.9 to 1.0 bar (with 550 hp and 531 lb.-ft. of torque, the normal CLS63 AMG model also boasts an increase of 32 hp over its predecessor). Despite added power and enhanced performance, all models offer high fuel mileage and low exhaust emissions. 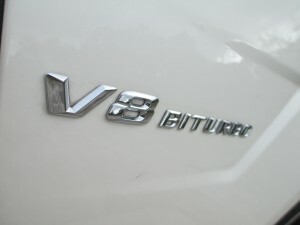 The AMG 5.5-liter V8 biturbo engine remains the most efficient high-performance V8 engine in production. Custom-tailored settings are among the many strengths of the AMG SPEEDSHIFT MCT 7-Speed sports transmission. Four drive programs, “C” (Controlled Efficiency), “S” (Sport), “S+” (Sport plus) and “M” (Manual), provide each driver with a personal setup. In “C” mode, gearshifts are smooth and comfortable. The ECO start/stop feature is active, turning off the V8 engine when the car is at a standstill, and the car generally starts in second gear. In the “S”, “S+” and “M” modes, the engine and transmission are noticeably more agile, and the ECO start/stop function is off. Perfectly tailored to a sporty driving style, momentary suppression of ignition and injection during full-throttle shifts results in even faster gearshifts that sound great, too. Automatic rev-matching during downshifts and RACE START are also among the standard features of the AMG SPEEDSHIFT MCT 7-Speed sports transmission. The performance-oriented AMG 4MATIC all-wheel drive distributes engine torque at a ratio of 33 : 67 between the front and rear wheels. This rearbiased torque split provides for superlative driving fun and handling. The 3-stage ESP® has been tailored specifically to the full-time, all-wheel drive system. In “SPORT Handling” mode, the Torque Vectoring Brake performs selective braking on individual wheels for outstanding agility. Briefly braking the inside rear wheel provides impressively neutral steering response during turn-in. The heart of the AMG 4MATIC all-wheel drive system is a transfer case with an additional power take-off to the front wheels. Neatly integrated into the AMG SPEEDSHIFT MCT 7-Speed sports transmission, the transfer case takes up virtually no extra space. Torque is transferred from the power take-off via a propeller shaft to the front differential, and power goes to the left front wheel via an intermediate shaft that passes through a sealed duct in the engine oil pan. 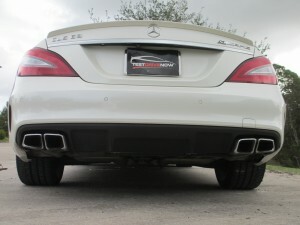 This compact design results in relatively low extra weight for the all-wheel-drive system – only 155 lbs. A multi-plate clutch with a locking force of 37 lb.-ft. helps modulate the transfer of torque to all four wheels as needed. Mercedes-AMG goes a step further on the CLS63 AMG S-Model with a standard limited-slip differential that’s installed within the rear final drive. This high-tech package increases traction even further, providing even better vehicle dynamics and more driving fun, especially on the racetrack. All CLS63 AMG models feature the AMG Adaptive Sports Suspension which features an electronically controlled damping system. 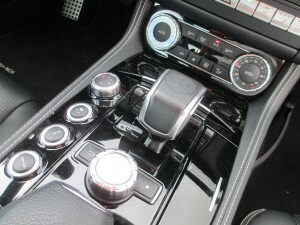 Pressing a button marked with a shock absorber symbol in the AMG DRIVE UNIT is sufficient to switch the electronics from “Comfort” to “Sport” or “Sport Plus.” The front wheels use a steel-spring suspension system, while the rear axle is fitted with a load-leveling air suspension system. 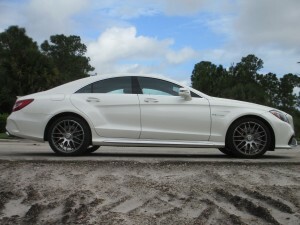 The three-link front suspension has been further optimized on the S-Model and the CLS63 AMG with all-wheel drive. Newly developed aluminum control arms enhance grip and agility as well as neutral steering during fast cornering. More performance-oriented elastokinematics are exclusive to the S-Model, offering the driver more neutral handling and even better feedback and wheel grip at the critical limits. Wider front track (0.9 inches or 2.4 cm) provides greater stability at higher cornering speeds and improved road feel. Increased negative camber on all wheels also helps boost cornering performance. 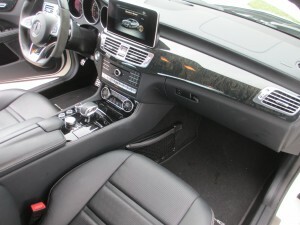 AMG’s electromechanical speed-sensitive steering complements the vehicle set-up. A rack-and-pinion steering ratio of 14:1 ensures agile handling in curves, and its variable power assist changes depending on the selected suspension mode. The high-performance S-Model features exclusive 10-spoke light-alloy wheels painted matte titanium gray with a high-sheen rim flange, while the normal CLS63 AMG is fitted with triple five-spoke light-alloy wheels painted titanium gray with a high-sheen finish. Both models are equipped with 255 / 35 tires mounted on 9 x 19-inch wheels at the front, while 10 x 19 rear wheels carry 285 / 30 tires. 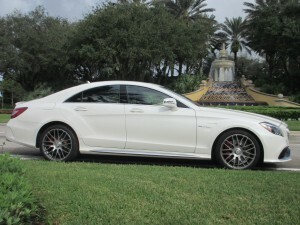 The CLS63 AMG is equipped with a high-performance AMG braking system that features 14.2-inch ventilated and perforated brake discs on the front and rear wheels. 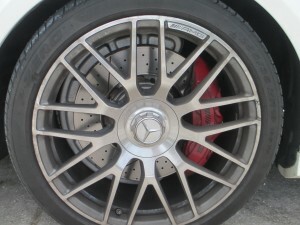 The front discs, which get especially hot, feature AMG’s compound disc technology that has been extensively tested in the field of motorsport. On the normal CLS63 AMG, brake calipers with a grey finish and white AMG lettering incorporate six pistons up front and four pistons at the rear, for quick, fade-resistant braking and short stopping distances. An AMG ceramic composite brake system is exclusively available for the S-Model as an option – recognizable by even larger 15.8 inches brake discs with an “AMG Carbon Ceramic” logo on bronze metallic calipers. The incredible hardness of ceramic brake discs provide greater resistance to extreme heat and ensure longer service life. This ceramic system is also about 40 percent lighter, reducing unsprung mass, which in turn enhances handling, agility and ride comfort. 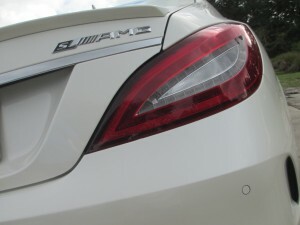 The CLS63 AMG S-Model can be indentified by red brake calipers and the AMG logo on the trunk lid that sports an “S” in contrasting black. Accented by silver seat belts, the standard black premium nappa leather interior of the S-Model features contrasting gray stitching on the AMG sports seats, center door panels, door arm rests, steering wheel and center console. The rim of the AMG Performance steering wheel in black Premium leather boasts grip areas in Alcantara® and is flattened at the top and bottom. In the S-Model, the front head restraints of the AMG sports seats feature the AMG crest embossed directly into the premium leather. 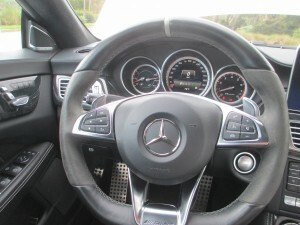 The AMG instrument cluster also reveals an “S AMG” logo on the speedometer and red accents on the dials. Illuminated AMG door sill panels with white backlighting complete the range of equipment and appointments exclusive to the S-Model. A highlight among the optional equipment for all CLS models is the Bang& Olufsen BeoSound AMG high-end surround sound system. Mercedes-Benz and AMG have created a high-end sound system in conjunction with renowned Danish audio specialist Bang & Olufsen. Capable of Dolby Digital 5.1 playback, the audio system provides an exclusive music experience with unparalleled sound, not only because of its 1,200-watt amplifier and 14 high-end speakers with neodymium drivers, but also due to the distribution of music signals that are controlled by an integrated digital sound processor (DSP). The DSP provides the option of selecting a special B&O sound menu on the COMAND system. In True Image™ mode, individual sound settings for the front, center and rear can be selected. The effect: a realistic sound experience at the selected listening position. The “Sound Mode” menu also has various preset sound modes that allow choices between a high-end “Reference” studio sound and surround sound. While “Reference” puts the focus on reproducing the artist’s sound, the special surround sound mode delivers a spacious sound experience. 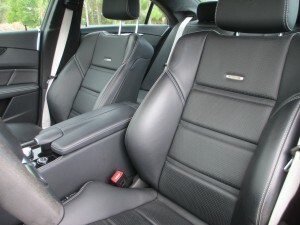 In particular, live recordings or concertos result in a unique panoramic sound within the vehicle without altering the natural sound of the recording. Illuminated 50-watt tweeters with acoustic lens technology, arranged in the mirror triangle, add special highlights, while high-end speaker covers in silver chrome with Bang & Olufsen logos also identify this exceptional highend surround sound system.